HPS Red Reinforced Silicone Radiator Hose Kit fits Hyundai 13-17 Veloster 1.6L Turbo. Ideal replacement or performance upgrade for the OEM rubber coolant hoses. Race proven design with high temp premium reinforced silicone material ensure the long lasting quality over the stock rubber hoses. Includes 100% stainless steel liner worm gear clamps for easy installation, which would not cut thru the silicone hoses. 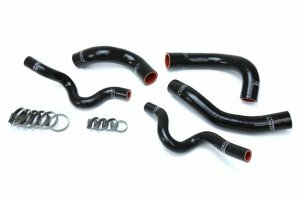 This brand new HPS High Temp 3-ply Reinforced Red Silicone Radiator Hose Kit for Hyundai 13-17 Veloster 1.6L Turbo is designed to replace stock OEM rubber radiator hoses which can eventually weaken over time, leading to premature failure. With premium quality silicone and race inspired design, this HPS silicon Radiator Hose Kit can withstand the harsh high temperature and high pressure operating conditions of the engine yet still maintaining peak efficiency during competition or daily driving. Old cracked or split radiator hoses are not efficiently cooling your engine which can cause it to overheat leaving you stranded. So maintain your vehicle cooling system by replacing your old brittle hoses now before it's too late. Perfect for racing or daily driving application. HPS silicone Radiator Hose Kit has all the correct bends and curves for a perfect fit replacement on your vehicle, compare to the universal hoses you can get from the local auto store, HPS hose kit is much easier to work with. Max. Temperature Rating: 350 deg. F. Includes 100% stainless steel liner worm gear clamps for easy installation, which would not cut thru the silicone hoses.